I was online window shopping and I found this shoe! I have to admit that I'm in love with the different textures. 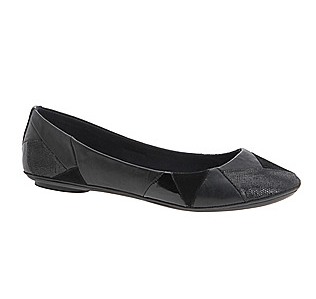 It's a simple black ballet flat, but it can easily spice up a simple outfit. I can image it paired up with a black wool pencil skirt. It's muted enough to fit in any setting (jeans for school, business suit in the office, etc), but fun enough to go out. I really don't want to use up my Jaqua Buttercream Frosting lip gloss, but I found out from my local specialty boutique that the Jaqua company is unresponsive. Does anyone know if they're out of business? I love that lip gloss too much! Like mentioned in the title (hehe), I'm going to start another Project 10 Pan. Hopefully this time I'll document it better. As I did for round one, I'm including skin care as well just because I don't use that much makeup. (My everyday look typically involves concealer, foundation, powder, eyebrow powder, mascara, and lip balm.) It'll add more to my list, but at the same time, I can't purchase any skin care products until I'm done the Project 10 Pan. I love blogging so it's about time I made one for beauty... right? So this one is for my love of enhancing inner beauty through the magic of makeup and other beauty products.